This week Chris Brown's been shooting the music video for 'New Flame' while Nicki Minaj continues to tease the release of 'Anaconda' - check out all the picture you shouldn't have missed this week. 1. 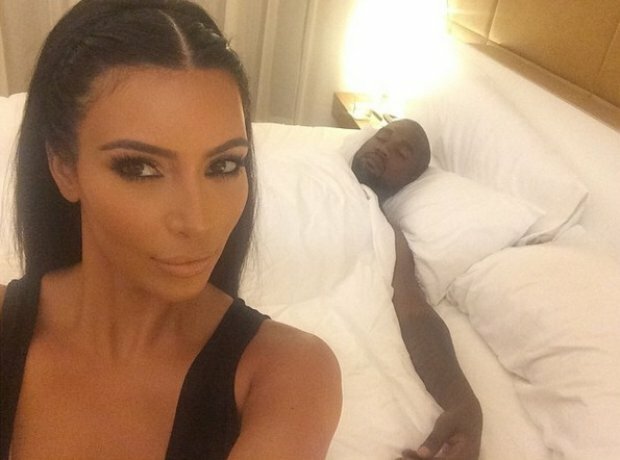 That moment when your wife (Kim Kardashian) posts a selfie while you (Kanye West) are asleep. 2. But Kanye got Diddy back with this photobomb. 3. Kanye, Diddy and Kim were all partying in Ibiza. 4. And they partied so hard Kate Moss fell asleep on Diddy's shoulder. 5. Meanwhile, Chris Brown was hanging out with Bono in France. 6. In Fact, Chris Brown, has taken over St Tropez this week. 7. He has been having the time of his life on a yacht in the South Of France. 8. And here's a bigger view of the bad-boy Breezy and friends are holidaying on. 9. Chris Brown was spotted taking over Nikki Beach in St Tropez during his holiday. 10. As you can imagine, the drinks were flowing. 12. And Nicki also shot a music video with August Alsina. She's been busy. 13. Beyonce's being doing some posing on Instagram. 14. Are you ready for your close up Queen Bey? 16. It doesn't take much to make Dizzee Rascal happy. 17. Alicia Keys and Swizz Beatz announced they have another baby on the way. Congratulations! Alicia Keys posted on Instagram: "Happy Anniversary to the love of my life@therealswizzz !! And to make it even sweeter we've been blessed with another angel on the way!! 18. Swizz Beats posted a similar photo with a heartfelt message. 19. Usher and Ludacris held a charity auction. 21. Rih had her Trapstar designed Monster Tour jumper on for the occasion. 23. Beyoncé shared this photo with the caption: "My favourite hue is Jay Z Blue"
28. Breezy teased his Instagram followers with this image... But when is the video coming?! 29. Nicki Minaj announced she's pushed back the 'Anaconda' release date by one week. 30. Beyoncé took 'On The Run' to Canada. 31. Disclosure took a 'first class' selfie. 32. Chris Brown continued to hang on the 'New Flame' video set. Wait... What's in his mouth? 33. Breezy's got new grillz! 34. Tiesto and Hardwell took over Tomorrowland. 40. Nicki Minaj shared this picture with her new friend. 41. Martin Garrix and Steve Aoki had way too much fun at Tomorrowland. 42. Kanye West and Kim Kardashian had a break in Mexico. 43. Snoop Dogg took this brilliant Selfie.